Note: The IRS released new withholding tables in 2018 to adjust for the tax overhaul legislation passed at the end of 2017. Because of lower tax rates and other changes, you may need to adjust your withholding if you intend to resist paying some or all income taxes (an act of civil disobedience) when you file in 2019. If you have a salaried job with withholding, you should have seen some changes in your paycheck and withholding. 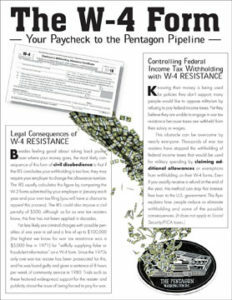 Use our formula on this flyer, or in Practical #1 : Controlling Federal Income Tax Withholding, to see if it is at a level that works for your resistance style; if not, you can change your W-4 anytime. 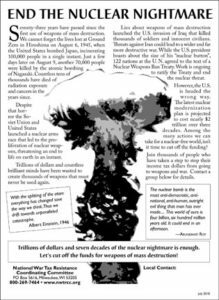 These flyers are designed for leafleting at events marking the August 6–9 anniversary of the atomic bombings of Japan (or anytime you choose). Download and print this 8 1/2 x 11 one-sided flyer for events in your community. Half-sheet flyer, designed to be copied back to back and cut in half for 2 flyers per sheet. Add your group’s name in the local contact box before copying. 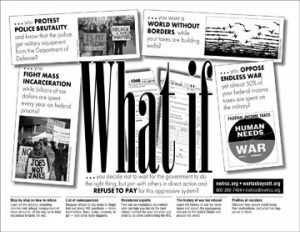 protest police brutality, fight mass incarceration, work for a world without borders…. 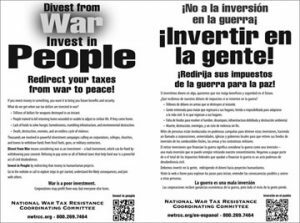 This popular, downloadable flyer draws together reasons to protest federal tax money spent on oppression at home with militarism and endless wars and connects readers to resources for more information on protesting with their money. One-sided, black and white letter-size flyers. 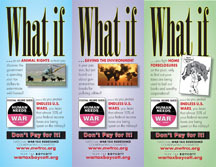 What if…..you work for animal rights, to save the environment, for affordable housing…. …. and worry about what your federal taxes are doing — or not doing. 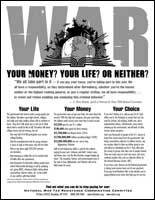 This flyer connects each issue to resources to help you refuse to pay for what you don’t believe. Anyone can use the Peace Tax Return to protest military spending or to report their resistance. 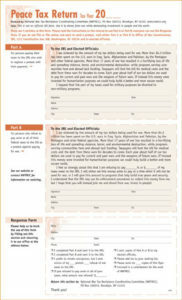 The flyer is designed to roughly resemble a tax form. Download the PDF or see our store to order brochure-style copies. 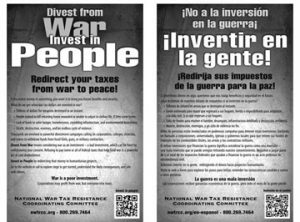 ¡No a la inversión en la guerra¡ ¡Invertir en la gente! 2-sided flyer with English text on one side and Spanish text on the other. 2 styles posted, one with a grey background. Click on the images to see the 2-page PDF. Download, print, hand out! 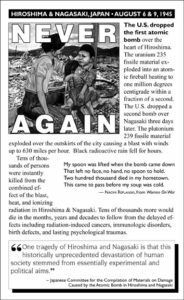 Download the PDF and copy it back-to-back for a half-sheet flyer you can hand out in your community. Click here for a web page that contains the text of the flyer and links to other sources. For more information, watch A Peace of Anarchy: Ammon Hennacy and Other Angelic Troublemakers . 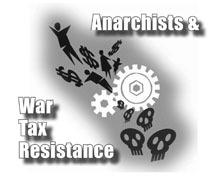 It includes a segment on war tax resistance starting at about the 16 minute mark. 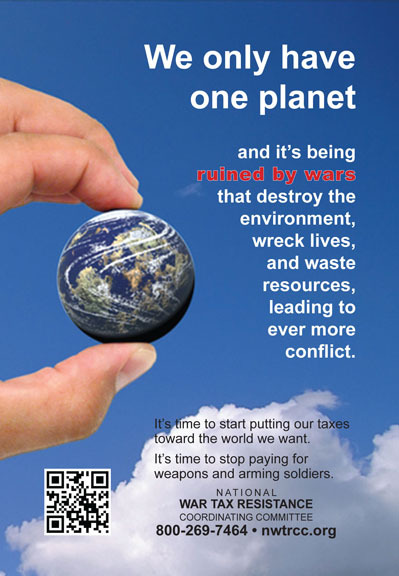 Outreach material concerning how the war budget helps to drive climate change and otherwise wrecks the environment.